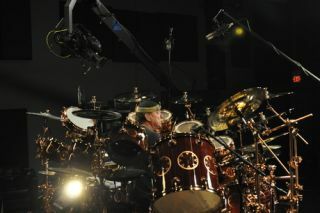 If you pick up the November issue of Rhythm you'll find news of Neil Peart's Taking Center Stage DVD. The three-disc set was put together by Neil and Hudson Music's Paul Siegel, Rob Wallis and Joe Bergamini. Below we have Joe's account of working with the Rush legend and how they put the seven-hour package together. "Waking just after sunrise, I stepped outside the door of my motel room in Stovepipe Wells, in Death Valley National Park, California. I had always wanted to see remote and breathtaking desert landscapes like this, but never really expected to have the opportunity. I took a short walk along the road next to the parking lot, admiring the sand dunes in the distance, and the jagged peaks of the Panamint Mountains marching away to the south. The tan of the desert sand mixing into the purple of the mountains and the deep blue of the early morning sky created one of those sights that you just take in for a moment, happy to be alive. I walked across the motel compound, past the stand of mesquite trees where a family of very large crows had kept watch on us for the last few days. "As we sat and talked for a few minutes, I couldn't help but smile to myself, and feel thankful for the opportunity to know and work with Neil over the last couple of years." "As I walked up the steps to the restaurant, I glanced over toward the parking lot, and it looked empty. I assumed the Ghost Rider had gone, and was speeding over some distant highway back toward the Pacific Ocean. I had planned on meeting the rest of the Hudson crew at 7 am for breakfast, but was up early, so I figured I would get a cup of coffee, read, and enjoy the scenery. As the hostess led me toward the back of the restaurant, I rounded a corner and found that I had been mistaken there was Neil Peart, the man who inspired an entire generation of guys like me to play drums, and one of the most revered rock musicians of all time, sitting there alone, looking over his journal. Even after having met him in 2008, and having worked fairly closely with him since then on the project which is the topic of this story, I paused. Neil glanced up, smiled, and invited me to join him. He showed me some of the newest 'passport stamps' he had collected on his visits to national parks. "As we sat and talked for a few minutes, I couldn't help but smile to myself, and feel thankful for the opportunity to know and work with Neil over the last couple of years. He turned out to be everything I expected: hard-working, intelligent, interesting, focused, and creative and, even better, a really nice guy as well. Soon we were joined by the rest of the Hudson guys, and enjoyed a hearty breakfast together before Neil set off for home. "This journey of working with Neil on his new Hudson Music DVD, Taking Center Stage: A Lifetime of Live Performance, has been one of the most amazing experiences of my life. In my position with Hudson Music, and in my travels as a professional drummer, I have been very fortunate to meet (and in some cases get to know) almost all of my favourite drummers. And, of course, working with Rob Wallis and Paul Siegel as their Senior Drum Editor for Hudson Music has been an honour in itself, since they have trusted me to collaborate with them on projects with some of the greatest drummers on the planet. I have been a huge Rush fan since I was 12 years old, and in my younger years Neil was my hero. I wore out my VHS copy of Exit Stage Left by repeatedly playing the video in slow motion to try to see what Neil was doing. I have seen Rush in concert just about every time they have come to the New York area, and even spent ten years playing in a Rush tribute band. "But as a fan of Neil's, of course I became aware of his private lifestyle exemplified by his never attending the kind of drum/music industry events at which I have met all the rest of my favourite drummers. Thus I believed I would never have the opportunity to meet him. "This journey of working with Neil on his new Hudson Music DVD, Taking Center Stage: A Lifetime of Live Performance, has been one of the most amazing experiences of my life." "In early 2008, Paul and Rob mentioned to me that in conversations with Neil, they thought he might be open to the idea of doing another project. Having worked with Neil on both of his previous drum DVDs, they knew that he would not want to cover any of the same ground again, but would want to explore and explain new areas. Knowing how familiar I was with Neil's work, Paul and Rob asked me to create an outline and proposal for him. This was exciting, but a huge assignment: trying to come up with something that would be interesting enough for Neil to want to do. It was also a major project for Hudson, so I didn't want to screw it up! "I wanted to be able to discuss Neil's entire body of work, including all the classic songs that made him the most emulated rock drummer of the late 1970s and the 1980s. However, I knew that Neil was a very forward-thinking artist, constantly in search of new ground, and not so interested in analyzing his past work. So this presented a structural challenge. "After bouncing several preliminary ideas off of Paul and Rob, the three of us took one of my extensive outlines covering Neil's entire body of work, and fine-tuned it into a presentation for him. They sent it to Neil for his opinion, as I waited anxiously. Finally word came back from Neil, and he seemed impressed by the knowledge that was presented, and even somewhat interested. Since he wanted to continue the conversation further, the guys suggested that they bring me to meet Neil, both so that he could get to know me a little, and potentially discuss the project further. I was pleased at this, but still a little unsure as to whether it would lead to actually working on a project with him." Check back tomorrow for the second part of Joe's story as he gets down to work with Neil on Taking Center Stage. For more on Taking Center Stage, including how you can win a copy signed by Neil plus other Peart goodies, look out for the November issue of Rhythm.